Do you get a kick out of soccer? Whether you're a youth league player, a soccer parent, or a World Cup fan, here at last is the book you've been waiting for. 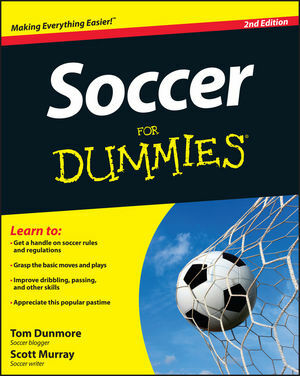 Now updated with the latest history, stats, and rules of this popular sport, Soccer For Dummies is the ultimate guide to the greatest and most popular sport on the planet. Tips on coaching, how to keep fit, and how to play "the beautiful game"
Tom Dunmore is the author of Historical Dictionary of Soccer, and the editor of several soccer websites and blogs including XI Quarterly. He is an avid Chicago Fire fan. Scott Murray is a soccer writer for The Guardian and FourFourTwo.